The 555 timer is very versatile. It can be configured to operate in a running (astable) mode or one-shot (monostable) mode. 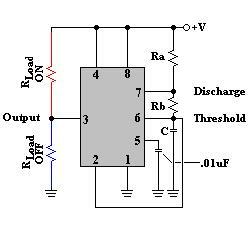 The ouputs can be normally on or normally off, with time periods ranging from microseconds to hours. Using a 1000uF capacitor and 9.1 kΩ resitor, the time period is 10.01 seconds. During the timing cycle, any additional trigger pulses are ignored. 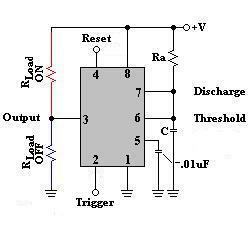 The timing cycle can be interupted, however, by applying a negative going pulse to the Reset terminal (Pin 4). The astable mode means the timing circuit is continuously triggered. The Reset terminal (pin 4) is tied to Vcc to prevent the timing ccircuit from being reset. The Trigger terminal (pin 2) is tied to the Threshold terminal (pin6).